Buying a property usually involves the signing of a purchase contract. Since buyers often have to qualify for a mortgage in order to buy a property, this contract usually contains a mortgage contingency clause. This clause will usually detail the terms of the mortgage commitment and will explain what will happen if the buyer cannot obtain a mortgage. Learn what the mortgage contingency clause is and five ways it protects buyers. When Is This Clause Needed? A mortgage contingency clause is only necessary in a purchase contract if the buyer is obtaining financing to purchase the property. This clause is not necessary if the buyer is purchasing the property in all cash. Why Is This Clause Important? A buyer may have a mortgage pre-approval when they make an offer on a property, but they cannot actually be approved until their lender verifies a number of factors about the buyer, as well as about the property being purchased. Since the buyer usually does not have an actual mortgage commitment when the purchase contract is signed, this clause is meant to protect both the buyer and the seller in the event that the buyer is not approved for the mortgage. Here are five of the most common terms that will be found in a mortgage contingency clause. 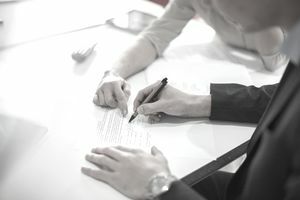 The first point of the mortgage contingency clause is to make it clear that all other clauses of the contract are no longer valid if the buyer is unable to obtain a mortgage commitment. This clause is a protection for the buyer because it allows him or her to get out of the contract without any legal consequences and without losing any money already deposited. This clause also protects the seller because he or she can move on to another buyer if the original buyer is unable to obtain the mortgage. Any fees that might be charged. It first protects the buyer if he or she is denied from getting the mortgage at all. Listing the exact amount that the buyer must be approved for serves as a secondary protection for the buyer. If he or she is approved for a mortgage but is not approved for the amount listed in the contract, he or she can cancel the contract without any further consequences. The final way that this sentence protects the buyer is by listing the interest rate that the buyer must be approved for. If the interest rate is too high, the buyer may not want to pursue the purchase further. Even if an exact interest rate is not listed in this clause, simply stating that the interest rate ‘must be satisfactory to the buyer; gives the buyer an out if they are not happy with the interest rate they have been approved for by the lender. This sentence gives the buyer a certain time frame under which they must obtain the mortgage commitment. This statement is meant to protect the seller. This time frame must be agreed upon by both the buyer and the seller, but it is usually between 30 and 60 days. If the buyer is unable to obtain the mortgage during this time frame, the seller is able to cancel the contract and move on to other interested buyers. This sentence gives both the buyer and the seller an out if the mortgage is not obtained by the financing contingency date. This sentence usually states that the buyer is entitled to the return of any deposit monies that they have already put down. The seller is allowed to walk away at this point as well. If a mortgage has not been obtained by the financing contingency date, either party must usually notify the other party in writing of his or her intention to cancel the contract. If the buyer has not received a mortgage commitment by the financing contingency date, the seller can agree to allow the buyer an extension to obtain their financing. The length of the extension will be agreed upon by both the buyer and the seller. The following is an example of a mortgage contingency clause that you may find in a purchase contract. The exact terms of the contract will differ as they must be agreed upon by both buyer and seller.